In a 2 ltr Pressure Cooker, add water, salt, oil and cook for a whistle on high heat. Immediately, release pressure carefully and mix in the ragi flour. Mix till it resembles like wet sand. Keep it covered with weight on for 20 minutes. Open, knead briefly after greasing the palms. Using the press, make thin strings on a greased plate or idli mould. Steam them for 2 to 3 minutes. Idiyappams are ready! Any flour need not be roasted? No need for roasting. If you roast, then water quantity may vary. Thanks for your visit. Thanks so much for sharing your experience. Your platter is so inviting and I ended up making them with MM flour! Thanks for validating the recipe! Thanks for trying and validating the recipe. 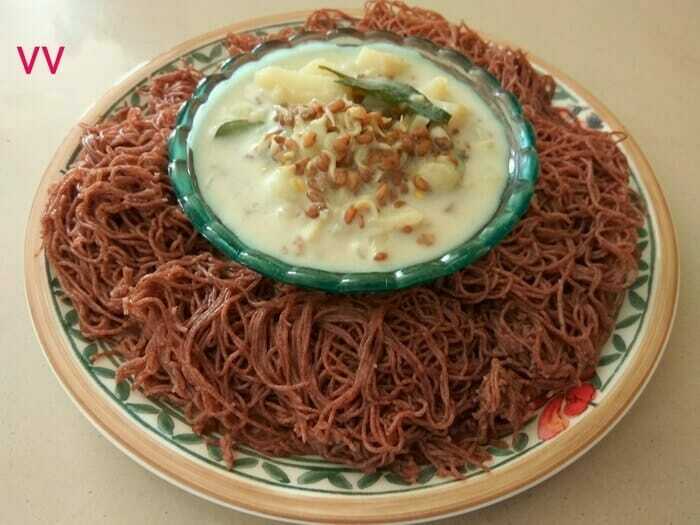 Happy to know that your family enjoyed the millet idiyappam. Expecting more validations from you!